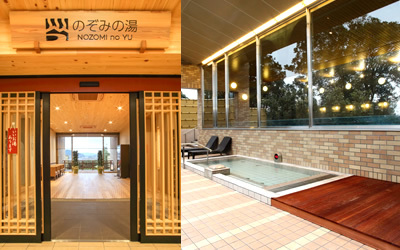 Large public bath which opened on 13 December 2014 in Hotel Twin Ring. We offer an indoor bath overlooking the international race course and vistas of the foothills' natural beauty surrounding the course. You can also enjoy the spectacular panoramic view and countless stars at night from the open-air bath. You can relax and spend fantastic moments healing your everyday tiredness.